At The Institute of Biobehavioral Medicine (IBBMed) we guide our patients on a loving search for truth, both within themselves and their environment, gracefully accepting what is, without judgment or resentment, while embracing change. Together we learn, heal and grow. At the Institute of Biobehavioral Medicine (IBBMed) we aim to fulfill the true definition of the term psychiatry, “healing of the soul”–first coined by Johann Christian Reil in 1808 (from Greek psychē: “soul or mind” and iatros: “healer”). 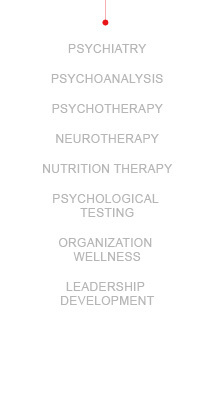 Our multi-disciplinary approach integrates the fields of psychiatry with psychology, neuroscience and spirituality. Psychiatry is an integral part of our treatment model at IBBMed. As physicians with post-graduate training in medicine, psychiatrists differ from other mental health professionals and bring a unique perspective to our work. Our psychiatry program focuses on mind-body health and wellness and aims to bring the latest innovations in diagnosis and treatment to our patients. Psychoanalysis has a dual identity: A comprehensive theory about human nature, motivation, behavior, development and experience; and a method of treatment for deep routed psychological pain and suffering. Our philosophy at the Institute of Biobehavioral Medicine (IBBMed) is that the human mind has an unconscious connection with the universe, and what we humans perceive is highly interrelated to who we are. In a spiritual sense, what is in our hearts motivates, informs and dictates our thoughts, emotions and perceptions. As a reaction to developmental trauma, either extreme deprivation or overindulgence-overprotection, the human mind shifts / regresses to a pure survival mode and the “true self” becomes sequestered under varying layers of defensive character structure. In a sense, there is a developmental arrest and the person becomes trapped in a time capsule, feeling, perceiving, and reacting to life as if they are constantly under the old threat. Since the original trauma and pain occurred in the context of a vulnerable and meaningful interpersonal bond, all connections come to represent a possible source of further pain and all meaning may be lost. Under such conditions, the capacity to love and be loved is significantly impaired and negative emotions, sense of inferiority and compensatory mechanisms run havoc in the persons mind and life. The damaged sense of self leads to difficulty in connecting the threads of one’s life and developing a coherent narrative of life experience. Conflicted motives and emotions undermine integrity, impair relationships and inhibit growth. Fear, anger, envy and despair poison hearts and produce ailments—both physical and emotional. A psychoanalytically informed treatment offers an opportunity to repair and restore the disturbed and damaged sense of self. An experienced and gifted analyst is able to address not only the source of the trauma, but the pathological compensatory mechanisms, which have become the source of pain, suffering and self-sabotage. At IBBMed we empower our patients to transcend their painful experiences of trauma and loss and accept the true nature of reality through mourning, personal growth and transformation. By reestablishing the restorative power of love, play and creativity, patients purify their hearts, reassess their values and dreams, and lead more meaningful and productive lives. It is too bad that you want to be someone else. Psychotherapy is best described as a structured encounter between a trained therapist and client(s)– the relief of distress or disability in one person by another, using an approach based on a particular theory or paradigm. Psychoanalysis is considered a depth psychology and psychoanalytic theories, which have given rise to the fields of Psychodynamic Psychotherapy, Cognitive-Behaviroal Therapy and Group Therapy. At IBBMed we utilize various psychotherapeutic techniques to address chronic forms of mind-body pain and suffering along with longstanding maladaptive patterns of relatedness. In an informal sense, some form of psychotherapy has been practiced through the ages, as individuals received psychological counsel and reassurance from others. Philosophers and physicians from the Hellenistic schools of philosophy and therapy practiced psychotherapy among the Ancient Greeks and Romans from about the late 4th century BC to the 4th century AD. Theoretically-based psychotherapy was probably first developed in the Middle East during the 9th century by the Persian physician and psychological thinker, Rhazes (AD 852-932), who is also considered the father of the field of pediatrics. At that time in Europe, serious mental disorders were generally treated as demonic or medical conditions requiring punishment and confinement until the advent of moral treatment approaches in the 18th Century. Psychoanalysis was perhaps the first specific school of psychotherapy, developed by Sigmund Freud and others through the early 1900s. Trained as a neurologist, Freud began focusing on problems that appeared to have no discernible organic basis, and theorized that they had psychological causes originating in childhood experiences and the unconscious mind. Techniques such as dream interpretation, free association, transference and analysis of the id, ego and superego were developed. Psychoanalysis is considered a depth psychology and psychoanalytic theories, which have given rise to the field of Psychodynamic Psychotherapy. At IBBMed we utilize Psychodynamic Therapy to address chronic forms of mind-body pain and suffering along with longstanding maladaptive patterns of relatedness. At IBBMed our therapeutic interventions focus on various disorders including but not limited to: Mood Disorders, Anxiety Disorders, Attention Deficit Disorders, Addiction Medicine, Mind-Body Medicine, Women’s Health and Eating Disorders. Cognitive-Behavioral Therapy is a form of psychotherapy that concentrates on the important role of thinking in how we feel and behave. Although the term “cognitive-behavioral therapy (CBT)” is a very general term and applies to several different approaches, including Rational Emotive Behavior Therapy and Dialectic Behavior Therapy, our approach at IBBMed is based on the Cognitive model of Emotional Response. This is based on the idea that our core thoughts and beliefs cause our feelings and behaviors, rather than external stimuli, such as people, situations, and events that are out of our control. This approach is extremely effective for various disorders, and utilizes therapeutic assignments and interventions to create consistency and to stimulate change outside of session. It allows for the person to assert their will and change or reframe their way of thinking, in order to feel better and have better control over their behavior, even though their external circumstances or situations have not changed. The focus of couples therapy is to resolve and alleviate the discord within a relationship between two people. At IBBMed we assist in assessing the root of the problem, help you decide what changes may be needed in the relationship and for each individual. During this process, we provide support and treatment for both parties to enhance their intimacy and growth together resulting in a more loving, and trusting experience of one another. Some examples of techniques used are: changing interactional patterns, communication, education, power struggles, unifying goals and breaking patterns that cause gridlock. The focus of family therapy is to identify the source of the issue between family members and the systemic dynamic that perpetuates this issue to continue. With family therapy we assist the family in learning novel, healthy and responsible ways of interacting while challenging the ineffective manners the family members previously used. Most families experience discord and it is often detrimental to each family member’s well being if left unresolved. At IBBMed we assist you family in experiencing one another with love trust and integrity to bring harmony and peace in your home. Group psychotherapy at IBBMed consists of a group of clients who meet regularly at a standard time to discuss a specific issue. A therapist who is specialized on the topic of the group conducts the sessions. Group therapy provides individuals with a sense of unity and support from those who are struggling with similar challenges. Studies have shown that teens and adolescents gain more emotional support and find treatment more effective while being around their peers. Group Therapy has been shown to be as or more effective than individual therapy for higher functioning adults. Clinical cases have shown that the combination of both individual and group therapy is most beneficial for such clients. Group psychotherapy can both help the individual overcome some of their emotional difficulties and create an open space for discussion and process as the group facilitator navigates the sessions. IBBMed will offer a variety of groups both by popularity and need. The clinician will make sure to meet the clients where they are at, in order to best serve their needs. Clients will be assessed once before the group sessions begin and once again after the sessions have been completed, this will allow the staff at IBBMed to monitor the client’s progression. The therapists will conduct the group psychotherapy sessions using various techniques that are most suitable for the group topic. Assess specific functioning or disability for school and work settings. Identify optimal treatment type or to assess treatment outcomes. Evaluate functionality for pre surgical, infertility or egg donation procedures. Assist courts in decisions for child custody, competency to stand trial, or civil litigation. Assess job applicants or employees and provide career development counseling and training. Psychological assessment is a process that involves the integration of information from multiple sources, such as tests of normal and abnormal personality, tests of ability or intelligence, tests of interests or attitudes, as well as information from personal interviews. Collateral information is also collected about personal, occupational, or medical history, such as from records or interviews with parents, spouses, teachers, therapists and physicians. Psychological tests are only one of the sources of data used within the process of assessment. Psychological Testing assists in further clarifying a diagnosis, and can elucidate reasons for treatment failure. For example, formal psychological tests may further elucidate the cause of inattention for a patient with signs and symptoms of ADHD. IQ, Memory, Perceptual Development, Attention and Concentration, Visual Perceptual Development Figure Ground Discrimination, Form Constancy, Spatial Relations, Language Development, Sensory Motor Development, Personality and Emotional Functioning, Academic Achievement. In addition, an emotional evaluation may be administered that assesses emotional development through an exploration of cognitive awareness, drawings, sentence completion tests and a personality inventory through interpretations of pictures. This emotional evaluation is often used to determine whether psychological issues are present and if therapy is necessary. At Ibbmed we provide clinical neurofeedback to regulate the individuals brain state with a variety of low frequency protocols selected for the individual. Neurotherapy helps alleviate a broad range of symptoms of a dis-regulated brain including ADD and hyperactivity, conduct problems, anxiety, depression, migraine headaches, traumatic brain injury and many other dysfunctions that affect emotional and physical well-being. With this brain exercise we observe your brain in action from moment to moment by monitoring your brain waves and assist your brain in reaching a more appropriate and stable brain state. By gaining better control of our brain waves we gain better control of our brain states, central nervous system and improve mental performance, emotional control and physiological stability. Along with regulation of the brain states we can also enhance creativity and work on peak performance for athletes, corporate executives and performers. Our goal is to help our clients reach their optimum potential. We work on regulating the mind and body to increase functioning and reach peak performance for each individual. We teach the brain to self regulate and perform at more harmonious state for the individual. All ages can benefit from Neurofeedback. Childhood problems such as bedwetting, nightmares, attention deficits and other forms of disruptive and disturbing behaviors can be alleviated. Adolescents who struggle with anxiety and depression or drug and alcohol use can be relieved of disturbing symptoms. For adults, symptoms of physical and emotional problems such as migraines or PTSD can be treated. Peak performers also use the neurotherapy training to enhance their abilities in sports, business and the arts. Eating well impacts all areas of one’s life. At the institute of Biobehavioral Medicine (IBBMed) nutritional consultation is a crucial component of our model of health and wellness, as we empower our patients to reach their maximum potential, both mentally and physically. Erratic meal patterns, restriction, inadequate nutritional intake, meal skipping, bingeing or making poor food choices wreak havoc on one’s metabolism. Not only these practices stress the physiological system, but also negatively impact psychological well-being and profoundly compromise relationship with food. The goal of nutrition therapy is to develop an individualized eating plan, based on eating food, not avoiding it. You will learn how to balance meals and snacks for maximum nourishment, energy and satisfaction. Together with the Dietitian you will establish a regular meal pattern, improve nutritional intake, expand food choices, dispel nutritional myths and learn how to use the body’s signals to guide when, what and how much to eat. In addition, you will be given tools for meal planning, separating eating and emotions and eating mindfully. By learning nutrition basics and healthy eating behaviors you will know how to make supportive decisions on your own based on sound science, common sense and your own tastes and preferences. A healthy body and a healthy mind go hand in hand. By improving nutritional status, you can create a solid foundation to approach other areas of life (i.e. relationships, career, etc.) empowered with enhanced clarity and strength. At IBBMed, we believe the human mind has an unconscious connection with the universe, and what we perceive is highly interrelated to who we are. Conflicted motives and emotions undermine integrity, impair relationships and inhibit growth. Fear, anger, envy and despair poison our hearts and produce ailments—both physical and emotional. Our goal is to help our patients develop a deep awareness of their mind, body and the mind-body connection, and to develop the capacity to listen to and trust their own internal voice. At IBBMed we guide our patients on a loving search for truth, both within themselves and their environment, gracefully accepting what is, without judgment or resentment, while embracing change. In this context, spirituality refers to experience of the ultimate or immaterial reality of life, an inner path enabling a person to discover the essence of their being and its connection with universe. Spiritual practices, such as meditation, yoga, prayer and contemplation foster nurturing thoughts, emotions, words and actions that are in harmony with a belief that the entire universe is sacred and, in some way, connected. Plato’s Allegory of the Cave, which appears in The Republic, provides a description of such a journey. As opposed to a preoccupation with sin, guilt or ritual, spirituality is about the heart of the religious experience and ethical life: love—the source of hope, healing and psychological resilience. In this context, purification of the heart requires the capacity for absolute forgiveness–the recognition that compassion supersedes justice, doctrine, dogma, and ritual. All past mistakes, errors in judgment, or acts of cruelty are due to ignorance of the reality of love. By reestablishing the restorative power of love, play and creativity, patients purify their hearts, reassess their values and dreams, and lead more meaningful and productive lives.